The Justice Now! Coalition held its first action of the weekend, the “Economic Shutdown 2.0” at 8:00 am on the day known as Black Friday, November 25, 2016. Congressman Charles Rangel joined Justice Now! Coalition members Justice League NYC, Reverend Calvin A. Butts of the historic Greater Abyssinian Church, Reverend Adolphus Lacey of Bethany Baptist Church in Brooklyn, Rev. 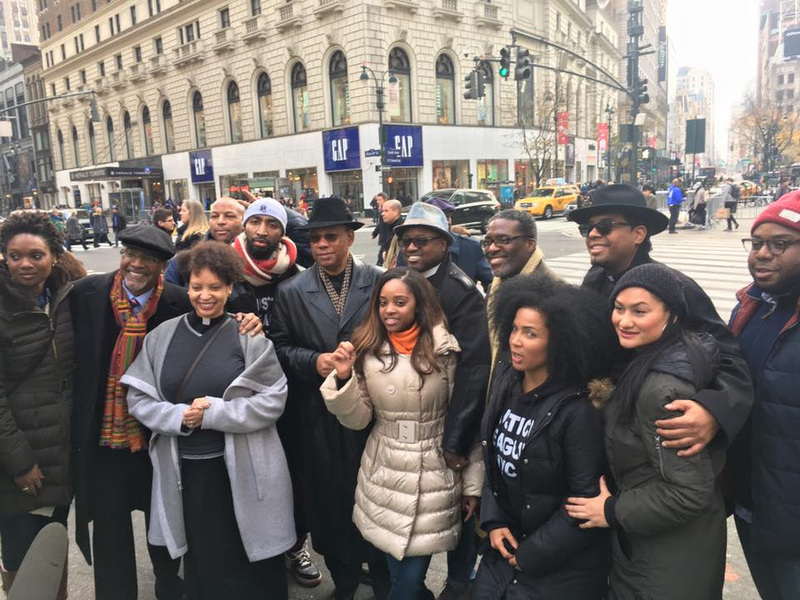 Dr. Peter Hetzel of the New York Theological Seminary, and other faith leaders and community activists before the demonstration which interrupted holiday shopping on what is well-known as the busiest day of the year for retailers. The Justice Now! Coalition is a multi-faith effort calling on Mayor Bill de Blasio to fire Officer Daniel Pantaleo, the NYPD officer responsible for the death of Staten Island grandfather Eric Garner. Two years after violating NYPD protocol by applying a chokehold which resulted in the tragic and unnecessary loss of Mr. Garner’s life, Officer Pantaleo still holds his job and collects a $120,000-per-year, taxpayer-funded salary. Mayor de Blasio has the power to fire Officer Pantaleo, yet has failed to do so amid pressure from the Patrolmen’s Benefit Association, the union representing NYPD officers. This weekend, the Justice Now! Coalition has additional actions planned, including a noon Vigil and Rally for Eric Garner and All Victims of Police Brutality, occurring Saturday, November 26 at the African American Burial Ground in lower Manhattan. On Sunday, November 27, the coalition is planning a “Call to Service” action in partnership with over a dozen houses of worship in New York City. Demonstrators flood the entryway of Macy's on Friday morning, November 25, 2016. Members of the Justice Now! Coalition stand together following today’s “Economic Shutdown 2.0” demonstration. (From left) Mysonne Linen, hip hop artist and member of Justice League NYC, stands with Rev. Calvin Butts of Greater Abyssinian Church and Rev. Adolphus Lacey of Brooklyn’s Bethany Baptist Church.